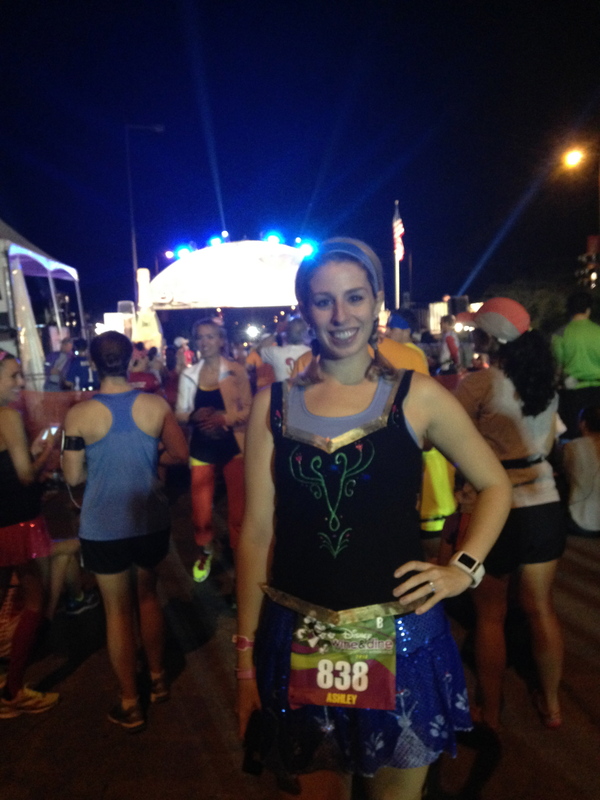 Race Recap: 2013 Disney Wine & Dine Half Marathon – Why Hello Dolly! For the third year in a row, I took the plunge and signed up for the 2013 Disney Wine & Dine Half Marathon. 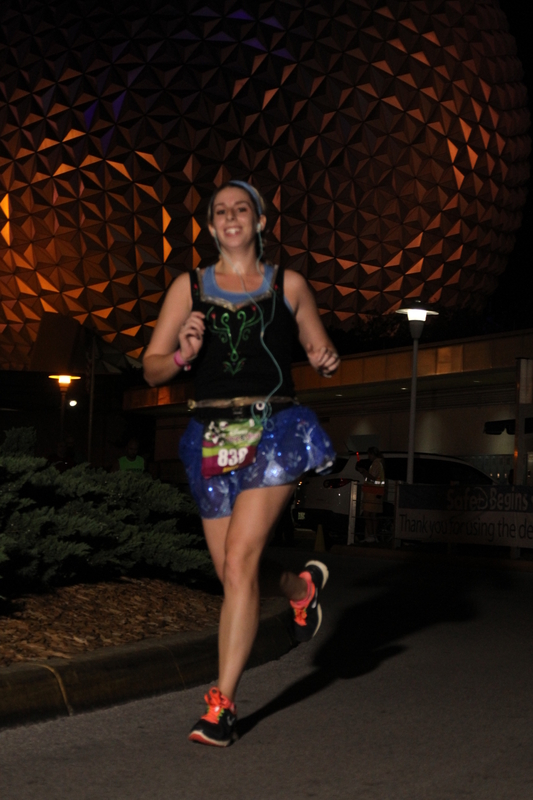 It’s really hard to pass up any of the Florida runDisney races because, let’s face it…how many people are lucky enough to live next door to some of the most well done distance races in the country? Although runDisney races are notorious for their high price tag, they end up being a heck of a lot less expensive for me than traveling to races out of state or where a hotel stay would be required. 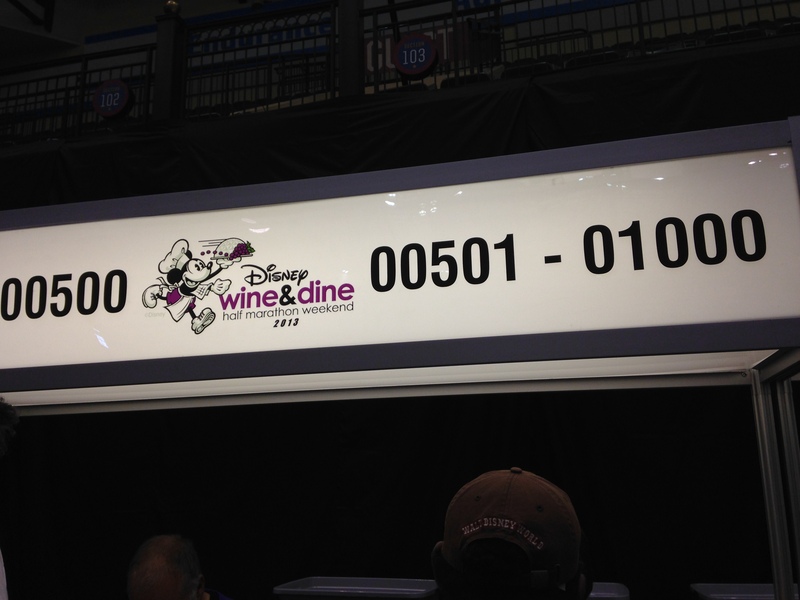 In an overall sense, I have mixed feelings about Wine & Dine. I’ve had races on this course that didn’t feel that great (ahem, 2011) and races that were major PRs (see my 2012 race recap – I was right on the cusp of breaking 2 hours this time last year). It’s also quite similar to the Tower of Terror 10 Miler course which has been a rough race for me during both of its 2 years of existence. I also couldn’t tell going into this one if it would be a good or a bad race. I know that my body is so much stronger than it was when I achieved my standing PR at the Tinker Bell Half Marathon in January of this year. I know I’m capable of a substantial new PR but just couldn’t tell if this would be the race. Although I didn’t have a bad feeling per se, I was not confident that this would be the race to do it. Forecasts indicated that is was going to be a warm one. Nowhere near the level of Tower of Terror’s historically hot and humid conditions, but warm. It was probably around 70 or just below as it turned out. While the temperature wasn’t bad, it was quite humid which probably didn’t help matters. I made the mistake of doing the hip hop cardio class at my gym on Monday of race week. I love this class and after missing a bunch of weeks, I figured it would be far enough out from race day that I wasn’t taking any risks. If I’m sore after this class, it’s usually in my normally-under-utilized arm, back, and shoulder muscles. Boy was I wrong this time. I woke up the next day with INSANE tightness in my calves that I just could not shake! Foam roll, stick, heat, etc. and not much progress. As a result of my crazy tight calves, I cut a lot of my mileage the rest of race week. While extra rest is not necessarily a bad thing during race week, the fact that it wasn’t resulting in improvement was frustrating. I put in my last pre-race run on Thursday night with my running group and while my calves didn’t hurt, I was running at a slow pace relative to normal but didn’t feel like it was easy like it should be. This really concerned me. Race weekend really snuck up on me this time. I’m usually sort of counting down but the expo just unceremoniously arrived. I picked up my bib and did a little damage between the official merchandise area and the Sweaty Bands booth. If my husband ever leaves me, you’ll all know it was because I bought one sweaty band too many. runDisney has now implemented and updated corral placement scheme where the number of corrals has roughly doubled to allow the size of each individual corral to be much smaller. While it was a little hit to my ego to see the big letter “B” on my bib (only because my qualifying times have gotten me into A for every race since probably 2011), I actually think the new system works quite well. I got a taste of it at Tower this year and expected it to go smoothly during this race weekend as well. I also tried something else for the very first time. I got a massage at the Florida Hospital booth at the expo. The price was actually quite reasonable at $25 for a 20 minute massage so I couldn’t resist. I was getting nervous about the relentless tightness in my calves so I asked the massage therapist to focus most if not all of her time on working those muscles out. She said “sure – I’ll start there and I can work into you hips and hamstrings if it seems like it’s working itself out.” My suspicions were affirmed when about 5 minutes in she tapped me and said “yeah, your calves are really tight. I’m just going to keep working on them.” She did a great job combining massage and stretching and my calves felt soft and supple when all was said and done. I can’t imagine what my race day outcome might have been like if I had not addressed this! I’m going to look into incorporating regular massage into my training regiment. It seems like my calves have an ongoing tendency to get themselves in knots. Race day arrived and I tried to rest as much as possible. Although I couldn’t sleep in due to a work commitment Saturday morning, I got back home and put my feet up as soon as possible. I snuck in a short nap during the middle part of the day and tried to keep to the normal eating schedule I adopt before a night race. I finished up my costume just in the nick of time and got dressed as our scheduled departure time arrived (I think we left the house around 7). Anna from the upcoming Disney release Frozen! Although even 2 weeks later I still have not yet seen the movie (it gets released next week), I have a feeling I’m going to love both the movie and the character. Plus, I wanted to do a costume that had not yet been done this time. Thanks to a retweet of the picture above from the runDisney Twitter handle, I got tons of positive feedback on my costume which helped to get me pumped up for the race (thanks everyone who favorited, RT’ed, or otherwise commented!). I arrived at Epcot where we were required to park with plenty of time to spare. Charles was my only spectator this year so he ended up boarding the bus with me so he could keep me company during the nearly 2 hours wait to start. The bus ride went quickly and we met up with our friend Dave who was also running the race to chat as we passed the time. Pro Tip! If you get to the pre-race waiting area early, leave your spectators and head into the runners only area to use the port-a-potties. The lines were SUPER short. I probably waited 3 minutes. Eventually, the DJ on the main stage let us know that it was time to head to our starting corrals so I kissed Charles goodbye and started walking. Dave and I were in different corrals as well so I said goodbye to him at this point. It was still about an hour till the race was to start so I headed to almost the very front of my corral and sit down to rest my legs while I waited. Despite being in corral B, the first corral was so small that I think I was actually much closer to the starting line than I have previously been when I’ve started with the first corral. Just a short 2-3 minutes after the first corral went off, it was our turn. The fireworks went off and I tried to coach myself mentally “start slow and steady.” My A goal was to run a 1:50 (breaking my previous 1:53 PR but a decent margin) but felt that starting on the slow end would be my best bet. I wanted to take mile 1 at about a 9 minute pace and increase my speed from there. Just after rounding the corner onto Osceola Parkway, we passed the 1 mile marker and I knew I was on track. No I adopted a new strategy for using my running watch which worked really well and I will continue to use it in future races. Rather than trying to do the math in my head of what my pace was at every mile marker, I set my watch to “manual splits” and hit it each time I passed a mile marker. This could rule out any of the inaccuracy caused by margin of error in signals OR not running the tangents. All I needed to know was how fast I ran each mile as it was defined by mile markers. We continued our journey down the fairly dark and boring Osceola Parkway and I felt fairly strong. Nothing like the way I felt during my big PR race in January, but solid. My pace was close to target (although I would really have to run closer to 8:25 consistently to reach my goal) but I was feeling mostly good. The overpasses on Osecola Parkway create some tough inclines that are probably close to a quarter mile in length each so it definitely wears on your legs. I tried to consciously gain ground on the downhills where I could. Mile 4 was in Africa where the course turns to run behind the Tree of Life if I recall. I usually speed up running through the parks but I guess not this time! I knew I needed to pick it up a bit and pushed a bit harder on my pace as we wound through Asia, at the base of Expedition Everest and through Chester and Hester’s Dino-Rama. From there we headed through some non-descript backstage areas and finally back into the Animal Kingdom parking lot. For some reason I always remember this part of the course well. I shouldn’t, because it’s really not worth noting but as you approach the 5 miles marker, you can see runners stretching ahead of you a good ways as well as the runners just entering the Animal Kingdom lot. A good song came on at this point and I started to focus again. There was a girl who was just a small margin ahead of me since about mile 4 who I was somewhat pacing against. When she started to slip further away, I kicked it up a notch. When I regained my ground, I knew I was on track. At this point she started to get too far ahead and I gave up on that notion. It’s not ideal anyway since she might have been speeding up or slowing down at any given point, but it gave me something to focus on for a while. We curled out of the Animal Kingdom lot and I had remembered seeing the 10k mark not too far away when we were on the other side of Osceola Parkway. My pace had slowed a little but I was staying pretty strong and steady. I coached myself mentally “just a few more tough inclines and then it’ll be easy from there.” I knew if I could finish the Osceola Parkway stretch strong, it would get easier (at least mentally) as I headed into Disney’s Hollywood Studios, around the Boardwalk, and through Epcot. It was around the 7 or 8 mark that I noticed a little discomfort in my knees. Knock on wood, but I have pretty good knee joints and usually no issues with them. I could tell the course was taking a toll on my legs but kept trying to stay on top of my pace. Much to my surprise as I look at my splits, I actually sped up a bit during a section where things were starting to feel a little bit harder. My little mental trick of telling myself the tough hills were over was a bit of a joke as I realized that we did head up the long hill that crosses over the Disney Hollwood Studios World Drive Gate and, although there was a downhill afterwards, we had to get from world drive UP to Buena Vista Drive. So things wouldn’t be getting easier just yet. This made for my slowest mile of the entire race. It was also when I ate my Shot Bloks which always screws things up just a bit as I try to manage (just before a water stop) pulling out the ziplock, getting the bloks, popping them in my mouth, and then grabbing a cup to take a swig of water. I went into “let’s just get through this” mode and tried to keep moving as fast as I felt I could at that point. We headed into the Hollywood Studios via a backstage gate and passed through the area I recognized as the finish line spot for Tower of Terror. We headed down Sunset Boulevard which I tried to enjoy despite not feeling that hot. I also started having intermittent stomach cramps which is never fun during a race. I powered through. We headed down Hollywood Boulevard, past the giant Sorcerer’s hat and through Pixar Place. Then it was backstage again. We went through the Costuming Tunnels that is normally part of the Backlot Tour only they had added some smoke and lighting effects. It made it hard to see but it was a very nice visual! I think i had forgotten just how much time was spent backstage here! I finally started to recognize areas new Lights, Motors, Action! and knew it was Osborne Lights Time! This is one of my favorite parts of Wine & Dine and I tried to enjoy it as much as I could. It’s just so darn beautiful! Ok, things were really starting to feel rough and my pace was starting to suffer. I was not going to fall apart at this point. We meandered backstage again, crossed through the park near the main turnstiles, popped through a very short backstage section and then entered the plaza in front of the park’s main entrance. The upcoming 12 mile marker was where I realized for the first time last year that I was going to be close to breaking 2 hours! Boy was I feeling different at that same point this year! I run the next section of the course all the time which I consider a big advantage since I know just how long it is and how much effort to apply. At this point, my strategy was to get through it as strong as my remaining energy would allow but I wasn’t holding out too much hope to breeze through the next mile. 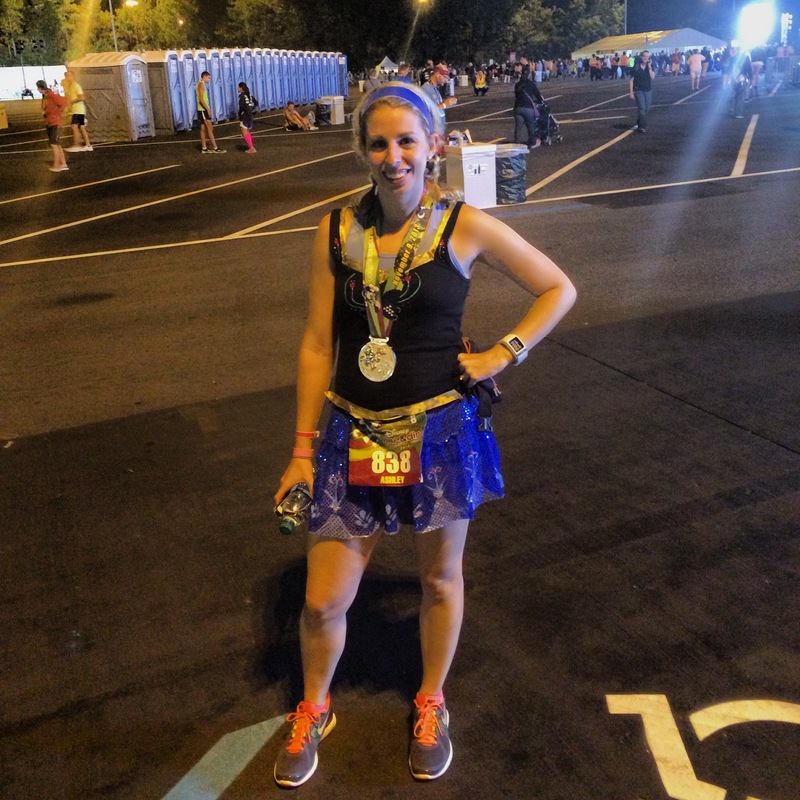 As I entered the last mile, I knew I could start to push it without risk of falling apart. I remembered this part of last year’s race really well which helped me as I coached myself to push through. We headed down a patch along the river, crossed a bridge by the Swan and Dolphin, and rounded the boardwalk past the Yacht and Beach Club Resorts. There are always lots of spectators out during the boardwalk section of the course so this is a nice change of pace from the rest of the race. We crested a little hill heading towards the International Gateway entrance to Epcot and I told myself “ok, this is the last real incline…seriously this time.” We headed through a backstage gate and towards the center of the park. We came onstage next to the imagination pavilion, crossed through the breezeway, ran behind Spaceship Earth and headed backstage again towards the front of the park. I knew the 13 mile marker was close. I’m proud that I had managed to pick that last full mile up! At least I know I dug deeper. I realized by looking at the clocks that, at this point, my PR was not and option but I did know that if I stayed strong, my time would still be one of my best. I started to feel a bit funny so I sat for a bit, used the rest room, and tried to regain equilibrium. I was just ready to get home so we started the long walk to the car before I really felt ready. I felt much better once I got to sit down in the car. I crawled into bed (still in sweaty costume – trust me, I’m not proud to admit it) and tried to feel more normal. I hydrated, ate some saltine crackers which seem to be some sort of miracle food and fought off feelings that were almost a little bit nauseated? It was hard to sort out. By about 1:30 am I felt pretty much back to normal and was able to actually get ready for bed for real this time! I didn’t feel super fresh during my first post-race week but I went back to a normal schedule for this week. The long run will be tomorrow but so far, I have definitely hit my mileage hard for the week. I have a couple 5Ks on the horizon over the next several weeks and will continue to hit training hard! I know a 1:5o or better is in my future soon…it’s just a matter of when! Luckily, I have 4 more attempts between now and the end of May! So, I’ll see you on the road! 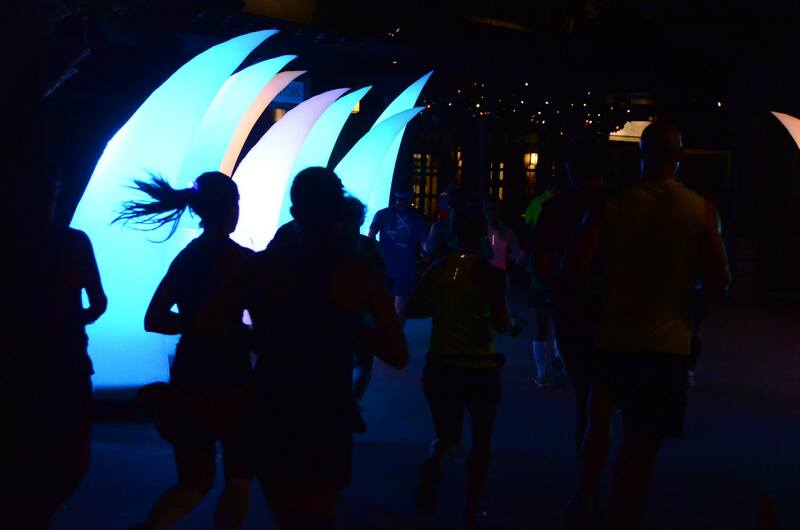 Did you run the Wine & Dine Half Marathon this year? How was your race day? Please excuse the tardiness of my response but thank you so much! I’ve been a bit of a lazy blogger recently but I appreciate the kind comment and your readership! Hi! I found your site after searching for Frozen Run Disney costumes. I’m running the Princess Half in Feb and was wondering if you made your costume or bought it from somewhere? It’s exactly the kind I am looking for. Thank you! Please do! 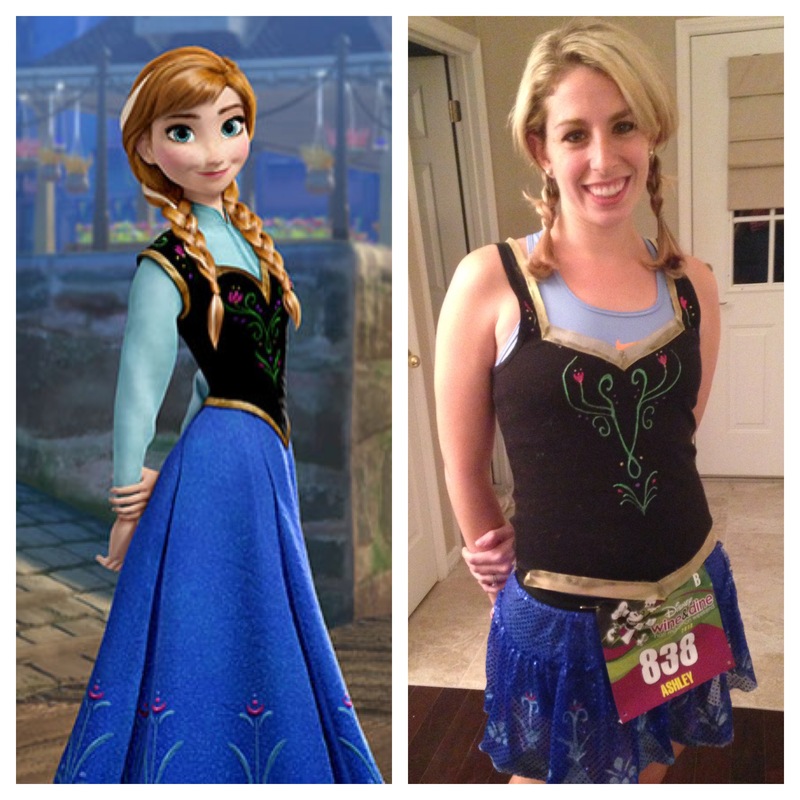 My sister and I want to be Anna and Elsa for the Disneyland Half Marathon. This costume is darling!! Id love more info on your costume as well. I’m running goofy next weekend and will be dressed as Anna for the full marathon. I have a tutu, but am struggling with the shirt!! Any tips would be super helpful!! Thank you! Looks like I’ll be adding a blog post to my weekend agenda :). Thanks for reading! I hope my tips will be helpful for you. This is an awesome post-thank you!! and add me to the how to Anna costume.. or at least where you got the pieces to it! 🙂 my best friend of 20 years and I are dressing as Anna and Elsa for the Princess 1/2! Pingback: HOW TO: Creating My Anna from Frozen Costume | Why Hello Dolly! Hi! 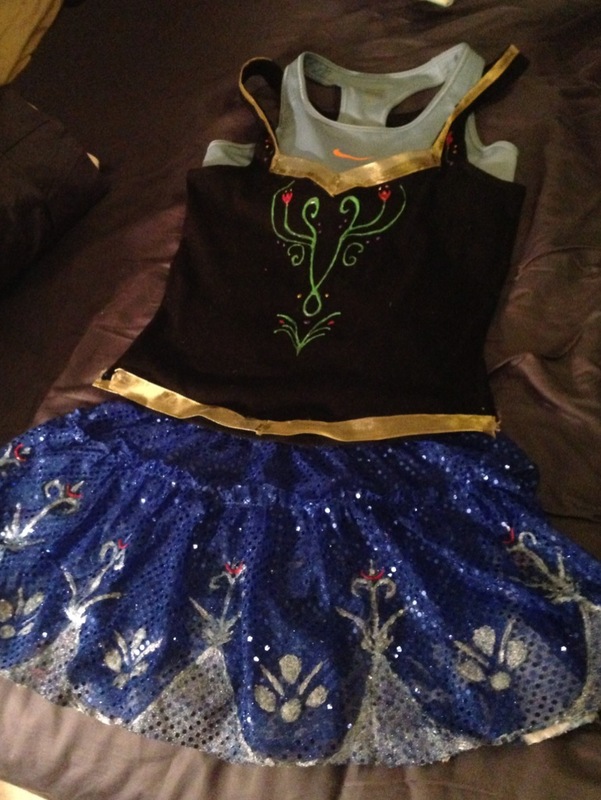 I found you because I was just wondering if anyone attempting a “Frozen” costume yet … yay! I’m too lazy to make my own costume, but yours is so cute! And great job at Wine & Dine! I was definitely feeling the heat during that race and it was making it hard to pull out anything close to a PR. Thanks so much Katherine! I was definitely questioning the effort while I was making it but I think it was worth it in the end! This Florida weather has been a real challenge lately! Can’t we get a cool race weekend?! After feeling today’s super cold Florida temps though, I promise I won’t complain about the warm weather for the WDW Half this weekend! 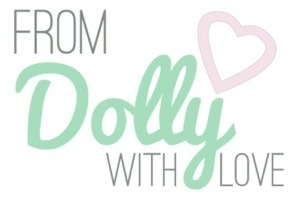 Thanks so much for finding me and reading my little blog! ok..FOR REAL!!! LOVE!!!!! My friend and I are going to use this! We are going to be Elsa and Anna for expedition everest. Do you have instructions of how you made this?!?!? Where did you get your Anna costume ? I found your blog while I was looking for anna costumes! Congrats on your Disney half!! I love the half distance but I’m not quite fast enough for the Disney cut off times yet. Where did you get your black top? So cute!! !